It has been a busy month in IJE with a wide range of events throughout the school. On Monday 28th April we marked Yom HaShoah in school with a moving and thoughtful ceremony put together by the students who visited Poland with the school in March. The film made by Jaz Eskenzi from Year 13, which was shown on the day, can be seen on this website. On the 6 May we spent the day marking Yom HaZikaron (Israel’s Remembrance Day) and Yom Ha’Atzmaut (Israel’s independence day) in school. Following a moving memorial service, we moved in to a day-long celebration of contemporary Israeli culture, through film, art, science, politics, food and music. We were also delighted to welcome a delegation of 30 Israeli students into school for the day through the UJIA’s Magic Moments programme. We also marked the start of the new month of Iyyar through our Rosh Chodesh workshops, celebrating through creative channels such as art, music, yoga, cartooning, graphic design and drama. 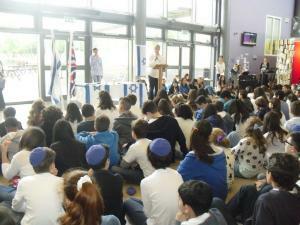 Finally we were delighted to roll out the IJE Enrichment programme for the summer term – ‘Young Jews Telling Joke’s! We are looking forward to the rest of the term, celebrating Shavuot in school, joining the Y9 trip to Israel and Tzedakah week.